Warlord Games have hit the ground running since the publication of Campaign: Desert War for Bolt Action. Having begun the range with some excellent plastic figure kits (see last week’s review) they have now added more metal and resin miniatures to compliment them. 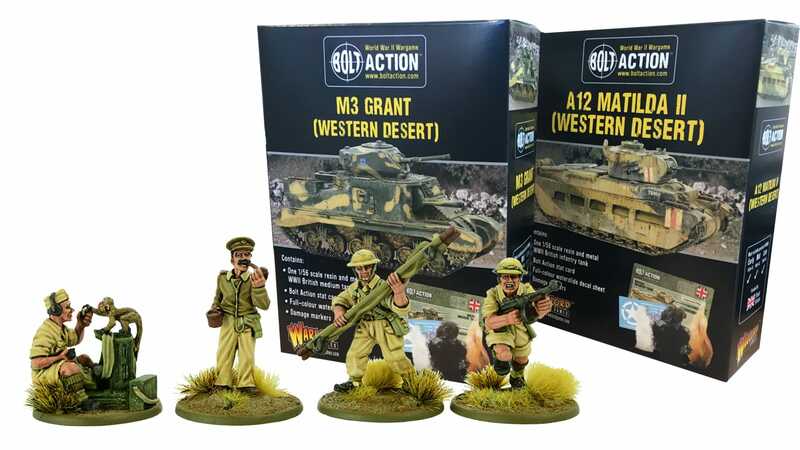 The first kit is a M3 Grant medium tank for use in the Western Desert. This is a resin kit, with four main parts, supplemented by gun barrels, hatch, tow rings and a commander figure in metal. The resin parts have chunks of surplus resin from the casting process which must be removed, but the kit itself seems to be easy to assemble and has the track guards associated with adding additional protection during combat. As is the norm now with Warlord kits, there are decals and a data card included, along with the equally ubiquitous ‘build your own’ damage marker parts. The second kit is a representation of the A12 Matilda II infantry support tank, sporting the special exhaust system for use in the harsh desert environment. Again, there are four resin parts to be assembled, the turret, chassis and track assemblies. There are more metal parts, including the additional side skirts which go ‘behind’ the track assembly and the external exhaust system. Again, the kit comes with data card for use with the Bolt Action rules and damage markers. The new metal miniatures released include a HQ blister for the 8th Army and the Afrika Korps. The 8th Army blister consists of four figures, a medic with stretcher, an NCO with a Thompson SMG and a seated radio operator with monkey ‘assistant’, but my favourite is the British officer, calmly smoking his pipe as he surveys the scene around him. The Afrika Korps HQ is also four figures, somewhat less whimsical but in the same configuration. The medic is posed in the act of treating a comrade, the radio operator is tuning his set and the NCO is drawing a bead with his MP40 as he advances. However, my favourite here is also the officer figure, in classic pose from the Airfix collection of my youth. 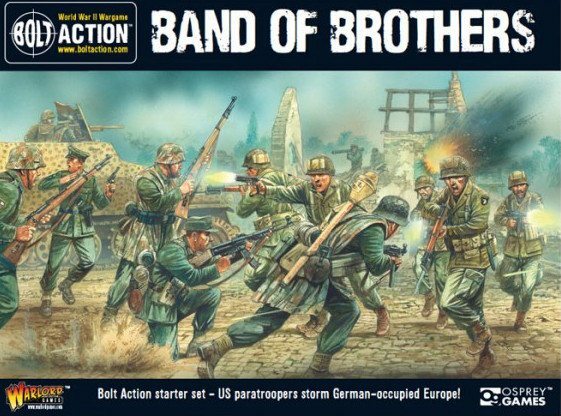 Warlord Games are currently the most prolific purveyors of 28mm plastic, resin and metal miniatures within the WW2 market, all designed to be ‘wargames friendly’ and often provided with enough options to field almost any type of unit for Bolt Action and this release adds to their already impressive portfolio.